When you think of the most essential equipment in a laboratory, those items that promote safety are at the top of the list. Autoclaves, which use high pressure steam to sterilize liquid, glass, and biohazards; micro bead sterilizers, which easily eliminate bacteria from small lab and research tools using a heated glass bead technology; and chemical safety cabinets, which provide a vented environment for chemicals--all three of these pieces of laboratory equipment are designed to promote safe and effective lab work. Here is more information on each type of equipment piece so that you can make the best decisions in your laboratory purchases. Distinct from disinfection, sanitization, and pasteurization, sterilization is any process that eliminates or kills all forms of life, as well as other biological agents such as viruses, which are not technically considered to be alive, but are still biological pathogens. One of the most popular tools for heat sterilization is the autoclave, which is also sometimes called a converter or steam sterilizer. Autoclaves use steam that is heated to 121-134 °C under pressure. The moist heat kills micro-organisms by the denaturation of macromolecules, primarily proteins. The moist heat method is a faster way to sterilize than dry heat, hence its popularity. To sterilize, an article is heated in a chamber with injected steam until it reaches a time and temperature setpoint. The article is held at that setpoint to finalize the sterilization process. The length for holding the temperature at the setpoint is entirely dependent on the material that is being sterilized. Liquids that are sterilized in an autoclave must be cooled slowly to avoid boiling over when the pressure is released. This is done by gradually depressuring the sterilization chamber and allowing liquids to evaporate under a negative pressure, while cooling the contents. When an autoclave is used properly, it will kill all resistant bacterial spores, as well as fungi, bacteria and viruses. However, it won’t necessarily eliminate all prions, unless the autoclave is used at a very high temperature for a very long time. Most autoclaves have indicators and charts that record and display information, such as temperature and pressure as a function of time. The information is checked to ensure that the conditions required for sterilization have been met. Indicator tape is often placed on packages of products prior to autoclaving, and some packaging includes indicators. The indicator changes color when exposed to steam, and provides a visual confirmation. Biological indicators can also be used to independently confirm autoclave performance. Simple bioindicator devices are commercially available based on microbial spores. Biological indicators may take the form of glass vials or spores and liquid media, or as spores in strips of paper inside glassine envelopes. These indicators are put in locations where it’s difficult for the steam to reach, in order to verify that the steam is penetrating completely. For autoclaving, cleaning is a critical part of the lab work process. Extraneous biological matter or grime may shield organisms from steam penetration. Proper cleaning can be achieved through physical scrubbing, sonication, ultrasound or pulsed air. Pressure cooking and canning are similar to autoclaving and, when done correctly, will sterilize food. When choosing an autoclave for a laboratory setting, size counts, both inside and out. No matter how large the autoclave equipment is, you will want purchase an autoclave that offers the most amount of space inside for sterilization, while also economizing on the amount of space that it takes up in the lab. There are larger autoclaves, as well as models that are designed specifically for benchtop use. Micro bead sterilizers are a handy and convenient way to sterilize tools, especially in a fast-paced research environment. Small research tools such as forceps and scissors can be sterilized and returned to the bench for further use, and an effective micro bead sterilizer will work through the day without overheating. Also known as glass bead sterilizers, they were once commonly used in dental and clinical settings, but are now reserved exclusively for research environments. 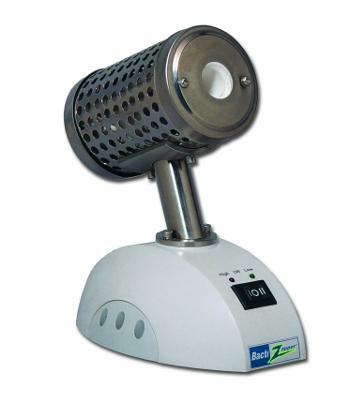 Micro bead sterilizers work by heating glass beads to as high as 300 °C. Instruments are then quickly doused in these glass beads, which heat the object while physically scraping contaminants off their surface. Because they don’t use a gas, flame, or chemicals to heat, they are useful in hood settings. When looking for a reliable micro bead sterilizer, you want to be sure that it has an adjustable temperature, so that you can also incubate items, as well as decontaminate plastic tools. Chemical safety cabinets are used to store chemicals that have vapor or residue. With the built-in ventilating system and filters, a chemical safety cabinet can reduce health and environmental hazards while storing chemicals. A chemical safety cabinet can be capable of containing the most infectious pathogens, however, its design affects its control of chemicals. It is critical to understand the limitations of the chemical safety cabinet you purchase. Make sure that the cabinet has a filtration system that is capable of capturing particles, including biological agents, so that you can protect work surfaces and personnel and keep the air clean by re-circulating or exhausting vapors and odors. When purchasing a chemical safety cabinet, you want to be certain that it will accommodate your chemical storage and usage needs safely and effectively. While some filters capture particles well, they may be poor at capturing volatile or vaporized chemicals. Many chemical safety cabinets are designed to recirculate the majority of filtered air within the cabinet and exhaust clean air to the room or an exhaust duct. If the chemicals in the cabinet are flammable, a cabinet that is unable to filter the flammable vapors could cause a build-up that could lead to an explosion. Recirculation of toxic chemicals could affect research results, and if the air recirculates into a room there is also a concern of personnel exposure. Check to be sure that the safety cabinet you purchase can handle all of the chemicals you expect to store and use. For more information on purchasing autoclaves, micro bead sterilizers, and chemical safety cabinets, visit the NextDayScience website.